Apple will open two new stores in Asia by the end of the week, signalling the company’s push into the Chinese market and determination to ensure the launch of the next-generation iPhone gets off to an encouraging start. 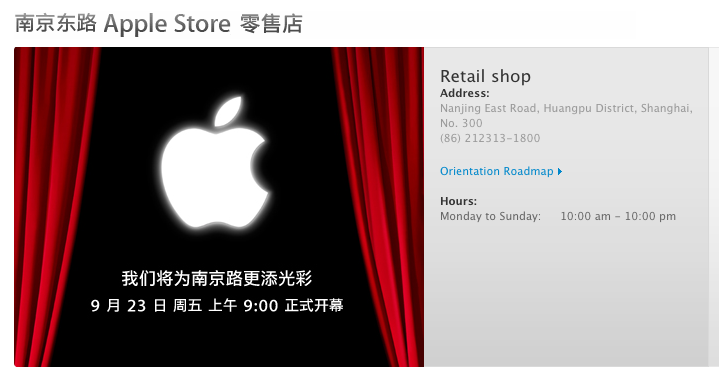 The Cupertino-based company has been working hard to open two new stores before the rumoured mid-October launch of the iPhone 5, confirming yesterday that it would open its new store in the IFC Mall in Hong Kong on September 24. The flagship store will be based in the heart of the country’s financial district, adhering to the Apple’s policy of opening retail stores in affluent areas. 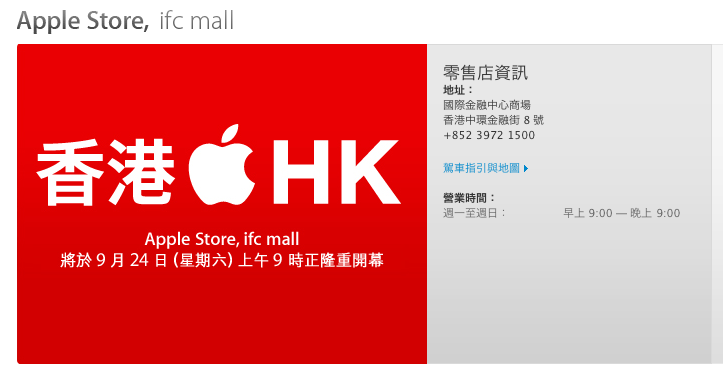 With notifications of the launch affixed to the building itself, Apple also launched a new Hong Kong retail page, also adding a specific page for the IFC Mall-based store. This morning Apple also made changes to its Chinese website, announcing that it will open its new five-story Nanjing East store in Shanghai on Friday, a day before the Hong Kong store. Last Monday, Apple “pulled back” the curtain on the hoardings protecting its new retail presence in Shanghai teasing the message “We’re about to light up Nanjing Road”. The new five-story flagship store was originally due to open in late August but was delayed due to heat issues and ventilation systems. Having resolved those issues, Apple expects to welcome over 40,000 visitors a day and will employ more than 300 staff. Apple will reportedly use the lower two floors purely for retail and sales, with the ground floor will likely be used to showcase new product launches (new iPhone 5 perhaps)? The second floor will feature the Genius Bar, as well as customer training from the Apple Creative Team. The top three levels will include a briefing room and administrative offices which will be utilised by Apple corporate employees based in China. Once opened, the store on Nanjing Road will be Apple’s fifth store in China, a country that the company has earmarked for huge expansion. Apple is expected to open its first Hong Kong store by the end of the third quarter as it aims to build on the $2.8 billion dollars it made in Asia in its last quarter. China Telecom is expected to partner with Apple, bringing the iPhone 5 to customers in the country. China Mobile, the country’s biggest mobile operator, is said to be in negotiations to launch a 4G-enabled iPhone 5 in 2012, although a deal has reportedly not yet been signed.